It’s a triple-decker radio sandwich today. 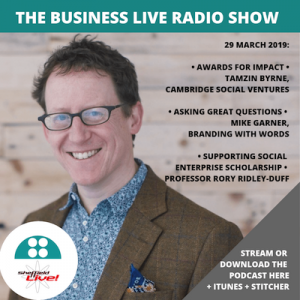 Guests Tamzin Byrne, Mike Garner and Rory Ridley-Duff serve up a stack of tasty insights (and a recipe to grow your business or social enterprise). Podcast links are below. Tamzin is Programme Manager at Cambridge Social Ventures (CSV), part of the Cambridge Centre for Social Innovation at the University of Cambridge Judge Business School. CSV helps social ventures to grow with business coaching, training, workspace. She covers the Cambridge Social Innovation Prize, a new Award of £10,000 + six months of business mentoring for up to four business leaders who can show they are creating “impact” – this can be environmental impact or social impact. The prize rewards achievement and ambition in social innovation. The organisers are looking for exceptional individuals running social enterprises or businesses whose work creates social change, whether that’s in a local community or on a national level. Tamzin gives more details about the prize, who can enter, the judges and the criteria. And she describes some of Cambridge Social Ventures’ other work. Mike is a copywriter and former translator interested in human communication and targeting your ideal client. He’s lived in France 20 years, and I only went and forgot to ask him for his wine recommendations. Doh. Mike has some extremely useful advice on why you should ask more and better questions of your customers, with specific tips you can use right away from this short interview. Lots more great advice about how to look into your customers’ brains on his website too (link below). And Rory is a Professor in the Business School at Sheffield Hallam University, and a director of Social Enterprise International and the FairShares Association. In June this year he will co-chair the EMES International Research Conference on Social Enterprise. He gives an insight into what this conference is (the theme this year is “Sustainable development through social enterprise, cooperative and voluntary action”) why it’s so important – and the new EMES Conference Solidarity Fund to increase the diversity and inclusivity of the research network. Here’s the podcast to download or stream (or find it in iTunes and Stitcher) – the timings are underneath. Apply to or get more details about the Cambridge Social Innovation Prize. Visit Mike Garner’s website, Branding with Words. Check out the EMES Research Conference and support the conference’s Solidarity Fund. The Business Live radio show is broadcast live every Friday on Sheffield Live radio and available as a podcast in iTunes here.